Oops! I forgot to post this on Sunday like I said I would. This is from the same die that I used on the post before this but I changed it up a little. So far, I used this die 3 different ways and I'm not sure which is my favorite. All stamps are from Hero Arts Halloween Ink 'n Stamp set. These stamps are smaller but they fit perfectly on the scallop circle punch from EK Success. How was your Labor Day weekend? It was nice and relaxing for me since I actually got to spend some time with my hubby for a couple days. Hope you're enjoying your Monday and thanks for stopping by today! I have another card to share with you and this time I won't forget to post it. This one is really cute! i think i have to go get this die now! =D TFS! Have a great week Cheryl! This box is so pretty with that scallop topper. 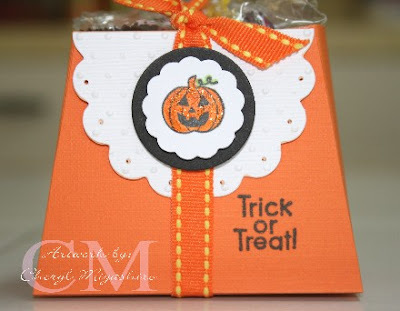 I realized I have this die but you put a new twist on this box - I love it and will try it soon. TFS. Another super cute box. I love the white scalloped topper. Is this part of the box? This is too cute! 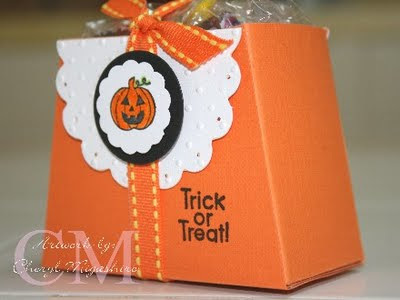 Love all your Halloween goodies boxes. Stopped by J's and saw Cliff yesterday. Love all the punches! Couldn't decide on which one I wanted so I didn't buy any, lol! TTYL!